The statistics are clear. It is much more dangerous to live in New York City, my previous home, than Jerusalem, my current (and hopefully forever) home. And yet, I never woke up to news of a massacre in my synagogue, thank G-d, and I never feared standing at a bus stop, and I never gave passersby the side-eye as I walked the streets of Queens. This is my new reality here in Jerusalem. The macro fears of this past summer, the rockets and the sirens, have been replaced by something far more insidious. The mood that surrounds me is much more reminiscent (and I have been loathe to even think it) of Jerusalem in 2001. In those days, I didn't take buses and I didn't shop at the shuk. I didn't visit the mall and I didn't go out in town. And I gave the side-eye to passersby, because you didn't know where, when or what might happen in the Holy City. And I am afraid. My family is calling me, panic in their voices, because the news is biased and the news is scary and the news is sparse and it doesn't come fast enough. And we want to see the pictures but the pictures are terrifying so we don't want to see them. And our friends are worried- our friends in Los Angeles and Detroit, Chicago and New York. Friends from cities with crazy crime rates are asking us to stay safe and be alert. People are questioning if I regret my move here, wondering whether I'll "come back home" to the US where it's safe and warm. But I am not afraid. I live in a country with a strong army, willing to lay down their lives for me, sacrificing their own lives for my safety. And even though the situation keeps getting worse I know that most of the government is tearing out their collective hair, trying to protect us. And it cannot be easy. There are lefties who want to appease our enemies and those on the other side who want it ended by any means necessary, and those from every side who just want it to stop. There is no easy solution, and I do not envy those decision- makers for whom there is no right answer. And yet I am afraid. The news doesn't stop. There is always a new terrorist, a new murderer and more information about those who don't deserve our time or our ink. But we are voracious in our desire for news; we have to know where they came from (Israelis, with ID cards and the right to vote and working in our businesses) and what is being done (Heaven forbid they weren't killed on sight and we have to treat them in our hospitals). The only thing we don't have to wonder about is why. It is because we are Jews. It is not because we are Zionists or settlers. It is not because we are policemen or soldiers. It is only because we are Jews and that is enough for them. But I am not afraid. I know that this land is the Jewish land, not because the UN recognized us or because we have foreign governments who tell us we can exist. It is not our land as an apology for the Holocaust or because we had nowhere else to go. This land is not Uganda, just a place for Jews to gather in safety. It is our home because it has always been our home. I'm not being hokey when I say that Israel has been home to Jews for thousands of years; I'm speaking about reality. You know what is not our home? Syria is not our home, nor is Libya, Iraq, Iran or Saudi Arabia. Lebanon is not our home, nor is Oman, Liberia, Morocco or Egypt. Afghanistan is not our home, nor is Jordan, Tunisia or Algeria. These are legitimate homes for the world's billion Muslims, but Heaven forbid we Jews be honest about the fact that Israel is our ancestral Homeland and will forever be. And still I am afraid. I lived through the second intifada and this summer's war. Moving to Israel is a risk. You risk being away from your loved ones and missing out. You risk not finding a job as good as the one you left. And you also risk being here when our "neighbors" get angry, when our neighbors are incited to kill without pattern or warning. You risk the land you live in being derided in the media, and the brave members of the IDF being demonized. You wonder what risks you should take. Do I really need to go in to town today? Do I really need to visit that friend in that area tomorrow? And even though we are a resilient country, you wonder "Is this all worth the risk?" But I am not afraid. I am not afraid because my faith in G-d is strong. And I know that this is not the case for everyone. 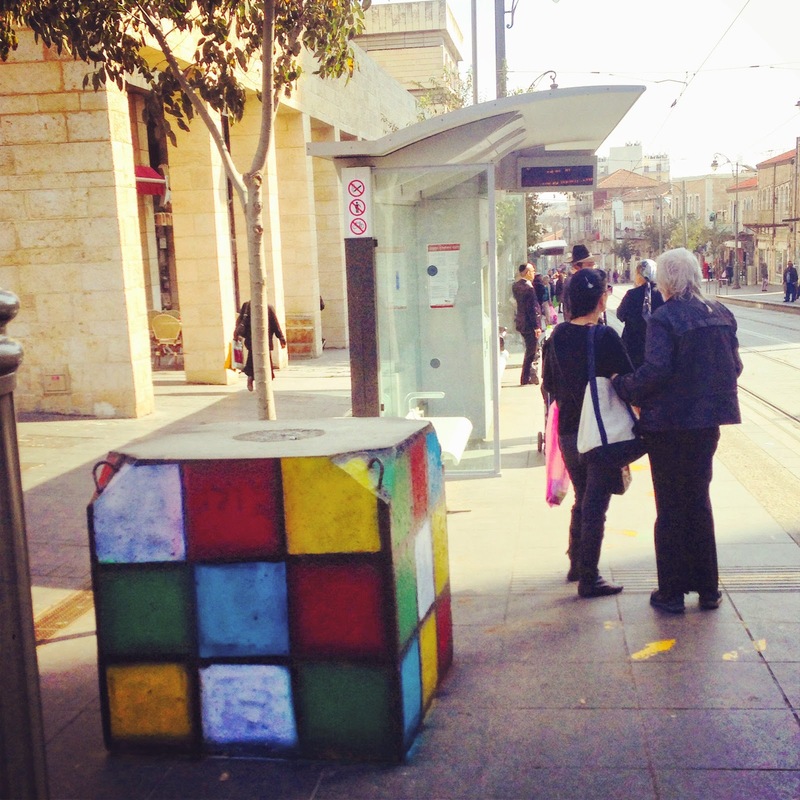 There are plenty of Israelis who feel differently, who draw strength from other places. But for me, there is a large sense of calm and peace that comes with the belief in a Divine Plan. And does this mean that nothing could ever happen to or around me (G-d forbid)? No, not at all. But there is a strength in knowing that we are not all-knowing and that we are part of a larger reality. This doesn't make the pain hurt any less and it doesn't make the fear disappear, but it does infuse it all with a sense of purpose. And that honestly helps. And even so, I am afraid. I want this to end. I want to go back to worrying about finding an apartment and a job. I want to start my search for the perfect sufganiya (donut) and to celebrate Hanukkah as an Israeli for the first time. I want to welcome my family here on their visit and show them all the amazing things I get to experience by living here. I want life, as they say, to go on. And I know it will. This, too, shall pass and all that good stuff, because the Nation of Israel will live on. It's not just a catchy saying, "Am Yisrael Chai." We will survive, we will thrive and we will live here in Israel, because it is our one true home, becauseit is ours. So I am not afraid.